Good when you want to emphasis an amount of change over time. Each line represents a data series. The area below each line is filled in. Gradient Fill - Preset gradients, Type, Direction, Angle, Gradient Stops, Color, Position, Transparency, Brightness, Rotate with shape. Picture or texture fill - Insert picture from file, Insert picture from clipboard, Insert picture from online, Texture, Transparency, Tile picture as texture, Offset x, Offset y, Scale x, Scale y, Alignment, Mirror type, Rotate with shape. Solid line - Color, Transparency, Width, Compound type, Dash type, Cap type, Join type. 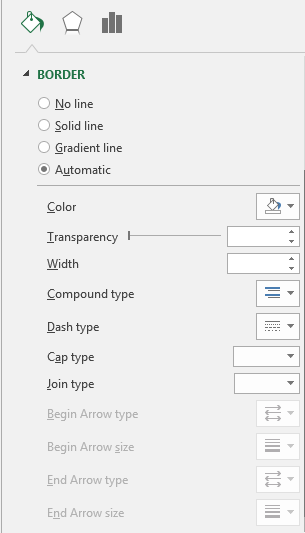 The four Arrow options are never enabled for column charts. Gradient line - Preset gradients, Type, Direction, Angle, Gradient stops, Color, Position, Transparency, Brightness, Width, Compound type, Dash type, Cap type, Join type. 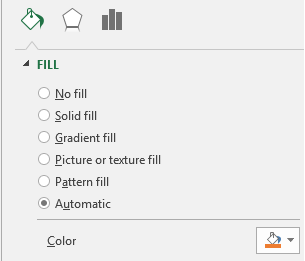 The four Arrow options are never enabled for column charts. In Excel 2007, the numerical value is not shown in the mouse over ?